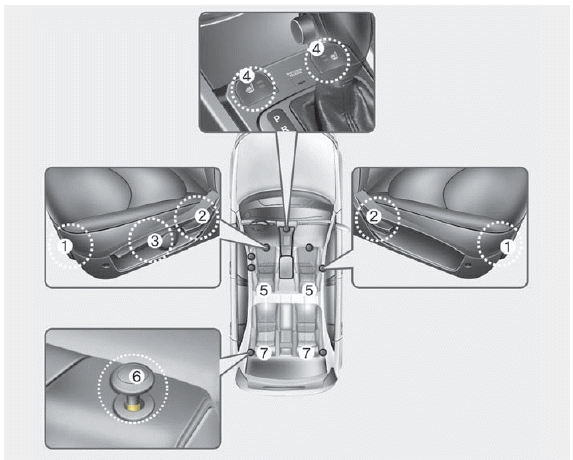 Loose objects in the driver's foot area could interfere with the operation of the foot pedals. Do not press the release lever on a manual seatback without holding and controlling the seatback. The seatback will spring upright possibly impacting you or other passengers. The driver must advise the passenger to keep the seatback in an upright position whenever the vehicle is in motion. If a seat is reclined during an accident, the occupant's hips may slide under the lap portion of the seat belt, applying great force to the unprotected abdomen. Occupants should never sit on seat cushions. The passenger's hips may slide under the lap portion of the seat belt during an accident or a sudden stop. Never attempt to adjust the seat while the vehicle is moving. This could result in loss of control of your vehicle. Do not allow anything to interfere with the normal position of the seatback. Storing items against a seatback or in any other way interfering with proper locking of a seatback. Sit as far back as possible from the steering wheel while still maintaining comfortable control of your vehicle. A distance of at least 10" from your chest to the steering wheel is recommended. Failure to do so can result in airbag inflation injuries to the driver. Always lock the rear seatback before driving. Failure to do so could result in passengers or objects being thrown forward injuring vehicle occupants. • Do not adjust the seat while wearing seat belts. Moving the seat forward will cause strong pressure on the abdomen. • Do not place your hand near the seat bottom or seat track while adjusting the seat. Your hand could get caught in the seat mechanism.